The iPhone SE still has an audience. Holding out against its big-screen siblings, this 4-inch handset continues to offer a compact, one-handed use guarantee no other current iPhone can muster. Update: There's no sign of an iPhone SE 2 and the original iPhone SE is getting ever harder to find in stores, but it's still a solid phone, helped by updates to iOS 12 and iOS 12.1.3. It is getting long in the tooth though, having launched well over two years ago, which means when compared to the likes of the iPhone XS, iPhone XS Max and iPhone XR it's significantly under-powered and feature-sparse. Yet, it's still a more than viable option for those looking for a low-cost iPhone, or a compact Apple handset. It's been updated to iOS 12 - the latest software from Apple - and unlike the XS, it has a Touch ID fingerprint scanner. At launch the iPhone SE price was $399 (£379, AU$679) for the 16GB model and $449 (£429, $AU749) if you choose the larger 64GB option - although things have changed since March 2016. Apple quickly discontinued the 16GB and 64GB variants, replacing them with more appealing 32GB and 128GB capacities. But now those sizes too have been discontinued, which is to say you can no longer buy the iPhone SE from Apple itself. At this point it's also getting hard to find the iPhone SE new in other stores, though refurbished handsets are still easy to get hold of. If you do find it new, prices vary, but you should be able to get it for around £280 / $300 / AU$550 if opting for a 32GB version. The 128GB version is a lot pricier though at around £450 / $450 / AU$670 and also seems even less widely available. 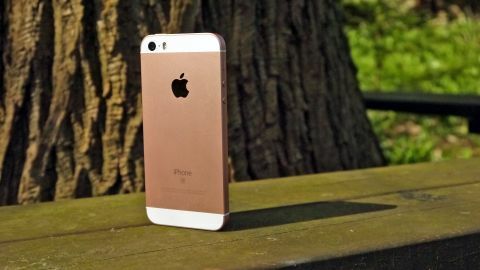 Check out the best plans around at our dedicated iPhone SE deals page. Fancy seeing the iPhone SE in action? We've filmed a video review of the palm-friendly iPhone for that exact reason - watch it below. Besides price the key selling point with this phone is the design. The chassis is precisely the same as on the iPhone 5 and iPhone 5S, and beyond coming in rose gold, doesn't offer anything new at all. That said, so many people are looking at the iPhone's evolution to the 4.7-inch display of the 6, 6S, 7 and 8 - not to mention the move to the X and XS - and scrunching their noses up a bit, not wanting to make the leap to the larger size of screen (and that's before we even get to the iPhone XS Max). The iPhone SE is designed to be easily operated with one hand, the 4-inch screen sitting just at the edge of a thumb stretch. However, internally things are genuinely supercharged, at least by 2016 standards. The camera had an overhaul, coming with the 12MP iSight sensor found in iPhone 6S, and offering the same array of tricks. That means Focus Pixels to offer clearer and faster autofocus, the improved two-tone flash and Live Photos, where a small amount of video is captured with every photo taken. 4K video recording and ultra-slo-mo movie modes really help sweeten the deal too. The power of the iPhone SE is something to behold as well - it's as powerful as the iPhone 6S and 6S Plus thanks to having the A9 chip, the M9 co-processor and 2GB of RAM. Compare that to the A7 chip with a measly 1GB of RAM from the iPhone 5S and side by side they're absolutely night and day in terms of speed and battery life management. Though of course newer models like the iPhone XS well and truly crush this for power, but at a much higher price. The M9 co-processor is an important element too, telling the phone when it should be heading into a dormant mode thanks to being sat quietly on a desk or in a pocket, which prevents the battery-hungry pings that lead to the red line of doom and you needing to reach for the charger at 6PM. Battery life is impressive on the phone, especially when you consider there are only a few mAh added in here, from 1,560mAh to 1,624mAh, and with no increase to the size of the chassis at all, this is a really impressive feat and addresses one of the key concerns we had with the iPhone 5S.